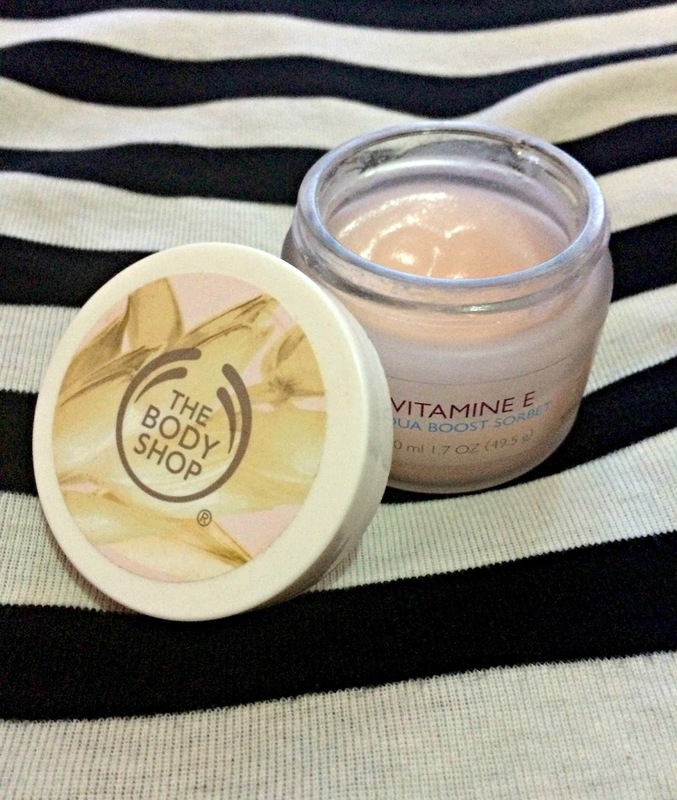 Before some days i did a review about the Vitamin E eye cream by The Body Shop so today i will make a review about a product which belong kind of in the same line.It's the Vitamin E Aqua Boost Sorbet by The Body Shop.It's something like the lightest version of the Vitamin E moisturizer cream.It came out around the summer and the smell as well as the texture will make you think that it's really a sorbet. 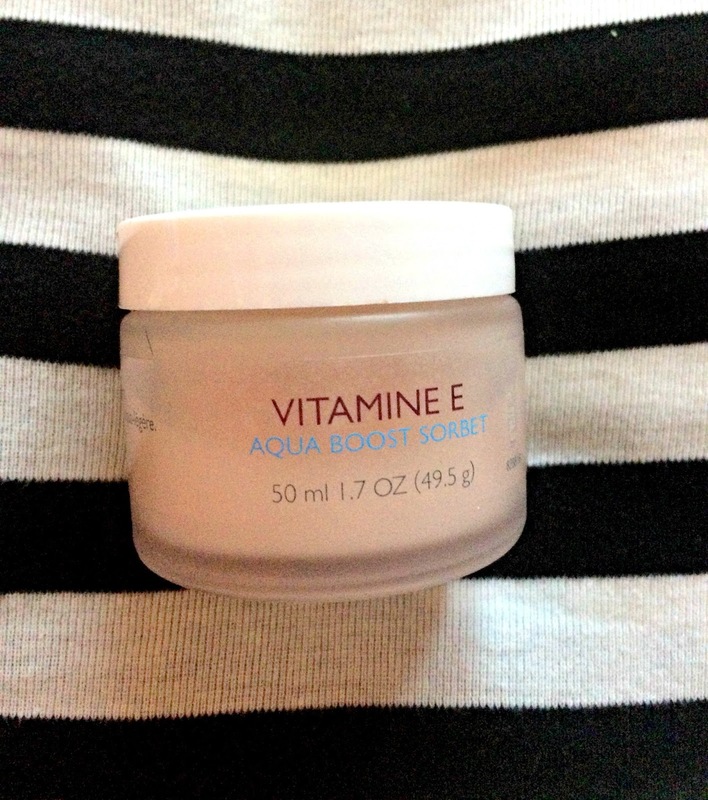 I love so much the texture.It's soft,light,and the consistency is like gel.I have combination skin,my T - zone it's oily and all the other face it's normal.I feel that hydrate my skin and at the same time has a refreshing and cooling effect.My skin absorb it really quick and easy without make it look shiny. Also it works really good as base for the makeup because it doesn't make your skin oily or greasy at all.And i know that it sounds weird but i think that help my skin and clear it.I use it a period with a little bit of acne in my skin and i see that it make it better or at least it was a big help. Aqua/Water/Eau (Solvent), Glycerin (Humectant), Dimethicone (Skin Conditioning Agent), Alcohol Denat. (Solvent), Silica (Absorbent), Butyrospermum Parkii Butter/Butyrospermum Parkii (Shea) Butter (Skin Conditioning Agent - Emollient), Sodium Acrylates Crosspolymer-2 (Absorbent), Phenoxyethanol (Preservative), Divinyldimethicone/Dimethicone Crosspolymer (Film Former), Ammonium Polyacrylolydimethyl Taurate (Emulsifier), Polysorbate 20 (Emulsifier), Tocopherol (Antioxidant), Triticum Vulgare Germ Oil/Triticum Vulgare (Wheat) Germ Oil (Emollient), Glycine Soja Oil/Glycine Soja (Soybean) Oil (Emollient/Skin Conditioner), Caprylyl Glycol (Skin Conditioning Agent), Xanthan Gum (Viscosity Modifier), Parfum/Fragrance (Fragrance), Menthol (Fragrance/Cooling Agent), Sodium Hydroxide (pH Adjuster), C12-13 Pareth-23 (Surfactant), Linalool (Fragrance Ingredient), C12-13 Pareth-3 (Emulsifier), Menthoxypropanediol (Flavour), t-Butyl Alcohol (Denaturant), Benzyl Salicylate (Fragrance Ingredient), Geraniol (Fragrance Ingredient), Citric Acid (pH Adjuster), CI 14700/Red 4 (Colorant). I love this moisturiser so much! it's light enough for the day and great for an evening moisturiser, one of my favourites! Great post! Hi, thanks for sharing your review. I bought it a week ago after receiving a sample first. Unfortunately I kind of regret buying it because I didn't realise that alcohol is the 4th ingredient listed. So now I feel a little confused because the alcohol is drying out my skin in certain places. So I am very surprised that they made a face cream that is meant to be moisturizing but it is also very drying because of the alcohol in it. This worries me a bit for the summer. Whilst I will wear SPF underneath it during the summer I wonder if the alcohol could leave spots on my skin when the sun hits it.